"I believe every minute with a child, student or client should be purposeful and positive. My instruction is intended to be meaningful, systematic, goal directed, data driven and client and family centered." I want my students and clients to be successful! Sounds simple, right? But there is so much that goes into helping individuals find their voice and feel confident in their communication skills. When I started my Teachers Pay Teachers (TPT) business in February 2017 and blogging journey in April 2017, I established my mission statement, "Building relationships through communication." 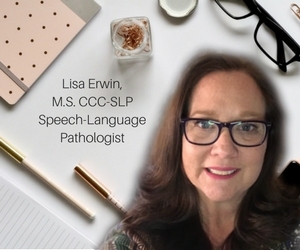 My name is Lisa Erwin, and I am an ASHA certified and Texas licensed Speech-Language Pathologist in Amarillo, Texas. I created this blog to connect with other speech-language pathologists, families, and educators. My goal is to make connections, build relationships, share my experiences and grow as a person and professional. I have experiences that span my profession and I have learned through trials, failures and successes. I strive to both teach and be taught in my journey. I am a licensed Speech Language Pathologist and have been practicing since 1992. I am currently employed as a full-time school-based SLP on a large elementary campus but also work part time as a home health provider. Early in my career I worked in an out-patient rehab where I learned to juggle a caseload of both adults and children. Looking back, I believe that shaped my love for all areas of my profession. I also taught elementary special education on a K-5 campus. while co-teaching in an inclusion classroom, I supervised a licensed speech therapy assistant. You might have noticed by now that I am a "multi-tasker." I take on several projects at once and I've been compared to the energizer bunny on more than one occasion. I also love going to thrift stores and flea markets, and cooking big dinners for my family. I am not a coffee drinker, but like a true Texan, I do love my iced tea! I am a wife and mother of three (not-so-little) children. I have two daughters and a son. they are as busy as I am and keep us going in many directions. I earned my Master's of Science in Communication Disorders and my Bachelor's of Science in Speech Language Pathology and Audiology from the University of Texas at Dallas. I am an active Member of the American Speech Language Hearing Association (ASHA) and CCC-SLP Certified. I hold a Texas License in Speech Pathology. I also hold a Texas Teaching Certifications in Speech Therapy, Special Education K-12, and Early Childhood Education. I am an active Member of the Texas Speech-Language Hearing Association (TSHA) and the Panhandle Speech Language Hearing Association (PRSHA). In 2018, I had the privileged of presenting at the Texas Speech-Language Hearing Association (TSHA) state conference on the topic: "Supporting Literacy and Language in the Preschool Classroom." Send me an email, Tweet, Instagram message, or Facebook message. I would love to hear from you and connect with you personally and professionally. I also encourage you to follow me on Instagram, Facebook, twitter, and YouTube. you can also find my products through Google+ and Pinterest. Sign up to receive your free product, sale promotions, SLP tips and Freebies. This site contains affiliate links to products. My Speech Tools receives a commission for purchases made through these links. Copyright My Speech Tools 2017. Simple theme. Powered by Blogger.